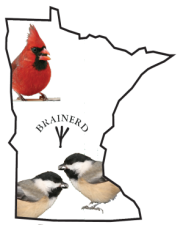 A new birding event will take place this winter along the Paul Bunyan Scenic Byway. The National Audubon Society has accepted the Uppgaard Wildlife Management Area as a site for a new annual Christmas Bird Count! This new count circle will be the first for this area and the first official bird count for any Minnesota Byway. Count results will be also posted at birdsofthebyway.com. Judd Brink is the organizer and data compiler for the Uppgaard WMA Christmas Bird Count. Please contact Judd Brink at (218) 838-4784 or e-mail for more information and or how you can participate in the 2011 count. What started as a unique printed publication to showcase the recreational attribute of birding in the region, has grown into an interactive web site. Local bird guide, Judd Brink, launched birdsofthebyway.com, an exciting new place to record and share bird sightings from around the Paul Bunyan Scenic Byway. Birdsofthebyway.com will also provide visiting birders ideas of where to go and what to do while in the area, as well as offer other birding information. As the 2nd largest recreational activity in the country, interest in birding is growing in the region. Marketing opportunities will be available on birdsofthebyway.com, and new fun features can be expected.